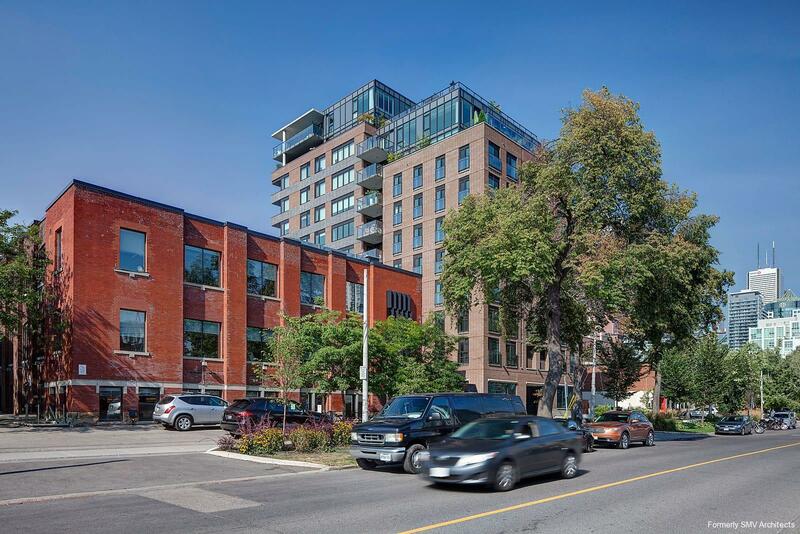 A valued client wanted to create a 100+ unit condo that would stand out in a rapidly changing area - on a postage stamp site (19,000 sf) pierced by laneways and walkways. The City’s Public Realm Policy emphasizes pedestrian linkages and public laneways. Our client understood the value of existing laneways both as a feature of this historical neighbourhood and a contributor to the potential appeal of the property, which fronts on an avenue with a welcoming broad boulevard. Our graceful solution maximizes the use of the site, above and below ground, with an L-shaped structure that echoes the quarter’s spirit and history. 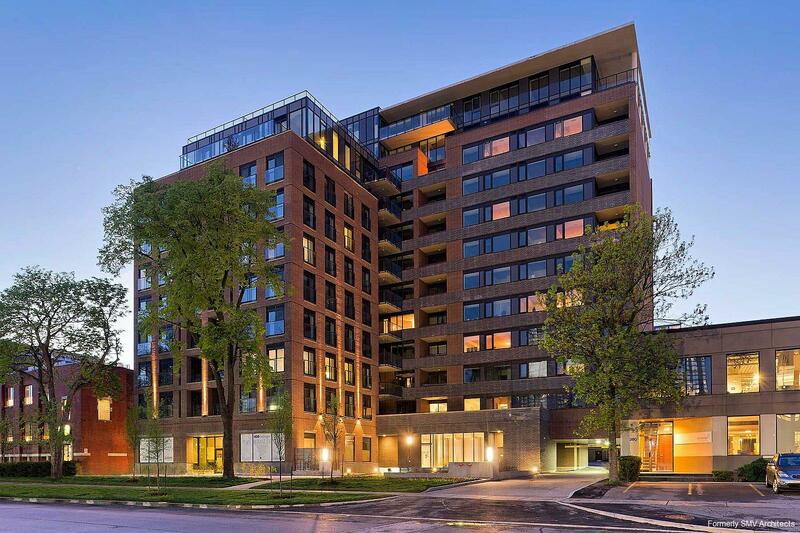 All with nine-foot ceilings, the 102 units, ranging from 510 sf to 1,770 sf, provide a comfortable downtown living experience that is peaceful and sheltered, yet only a short walk from the entertainment district. The neighbourhood’s human scale arises from mature trees and the many 19th and 20th century warehouses slowly being restored and converted for use by high-tech, arts, and entertainment industries. The area – and this highly contextual addition – pleasingly contrasts with the ranks of tall glass towers of neighbouring developments with its level of masonry craft. 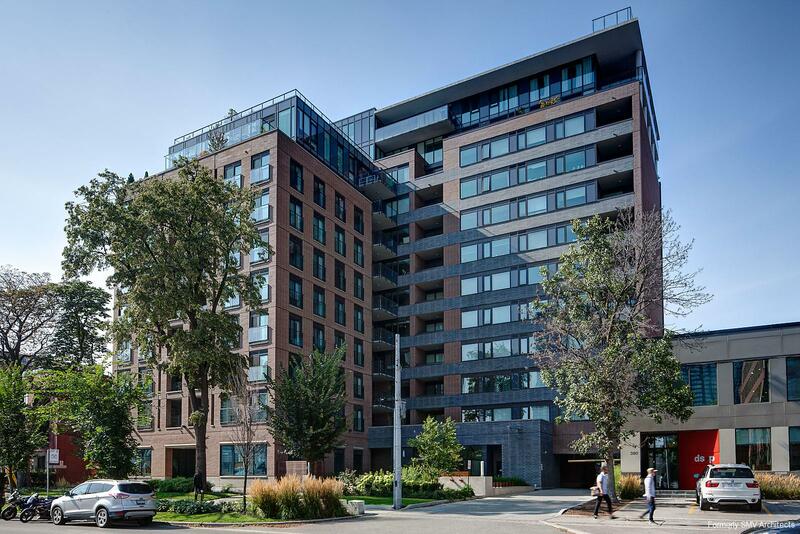 Clad in metric Norman brick, the front 10-storey wing draws on the verticality of pilasters of nearby heritage red-brown warehouses, while the set-back 12-storey section in charcoal block was inspired by a mid-century warehouse with a more horizontal expression. In both, the inset balconies enrich the effect. Perfectly in proportion, the two masonry types course together logically and overall, the impression is of clean, classic masonry detailing, without decoration. 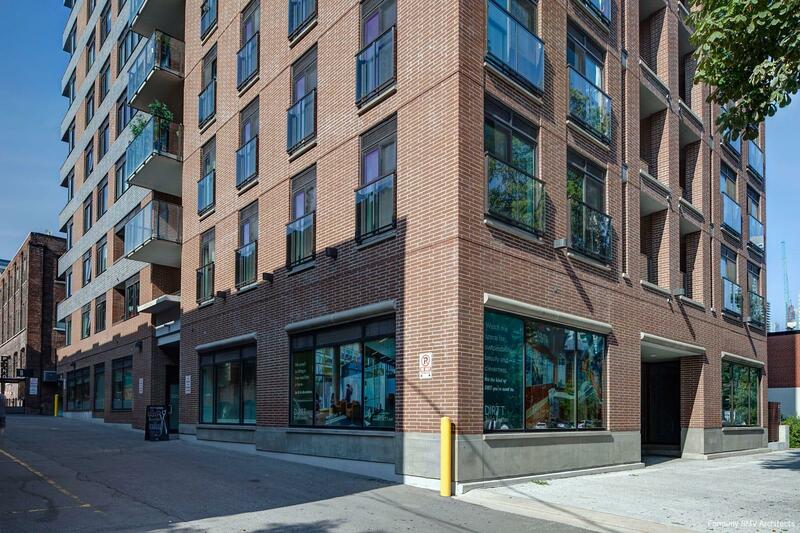 Meeting the City’s guidelines and adding a sense of community, the pedestrian walkway through the laneway also provides retail opportunities at grade. 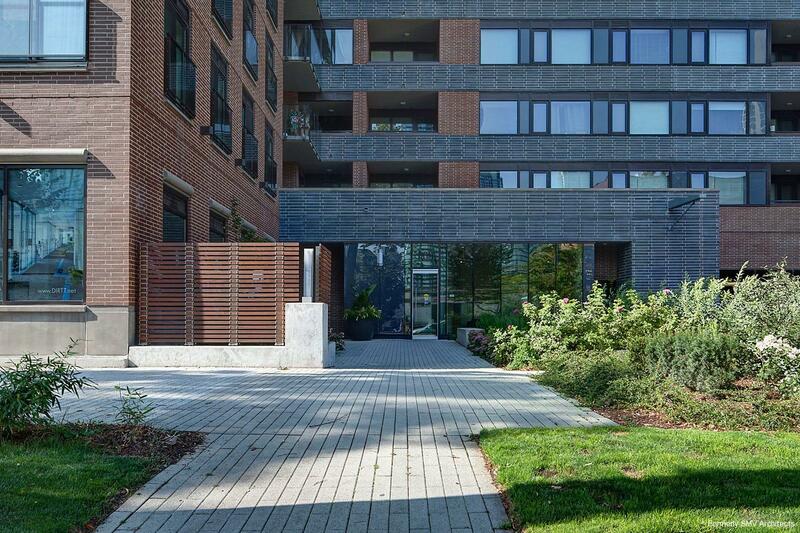 The residential lobby is recessed behind a generous landscaped forecourt. Keeping the frontage pedestrian-oriented, we tucked the ramp to the underground parking between the lobby and amenity spaces along a driveway leading to concealed loading spaces at rear. We were even able to provide additional parking for another of the client's developments nearby, maximizing the functionality of the valuable underground real estate.